I hope he has collision insurance. Disaster Report begins by introducing your setting: a completely manmade island with a newspaper that needed a reporter. 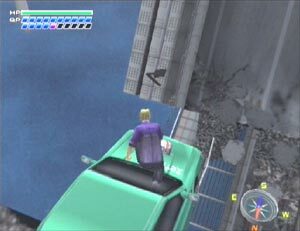 While crossing a bridge from the airport to the city en route to filling that role, the main character, Keith, suffers a major setback in the form of an earthquake, the aftershocks of which continue throughout the game. A helicopter sees you, but is not able to rescue you and instead drops some provisions (this is a recurring theme). If Disaster Report were a movie, we would probably consider this premise clichéd, and dismiss it. It is a very fresh idea for a game however, and is therefore intriguing. There are some very ambitious aspects to the game. The most obvious is that the tremors that occur during gameplay affect the environment of the game. Exits are closed off, new paths are opened, and detritus creates or destroys bridges. 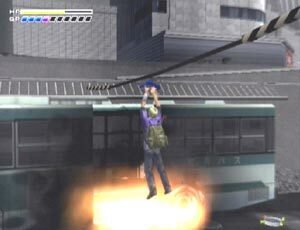 This seems contrived at times (several trucks falling all in a row), but keeps the player on his toes, and works, largely because it is not the sole focus of the game. Keith makes a raft by scotch taping a piece of fence to some empty barrels. MacGeiver would be jealous. Keith interacts with a number of NPCs, conversations with whom can affect the course of the game. Those who travel with you are not helpless, as wards frequently are, but they are not about to find hidden ways out of tight spots, either. If they were more independent, they would probably end up subtracting time from an already short (~7 hours first time) game. There are a number of paths you can take, several of which lead to different endings (7 total) of varying desirability. I give the plot a lot of credit for creating a fairly tense survival mood without resorting to the use of zombies. Without giving anything away, many of the character interactions and even endings are very satisfying. Unfortunately the game has a few serious problems. I do not generally treat a game too badly if its graphics are subpar, but this game’s strength is in the fact that it is a cinematic adventure story that you are able to control. When everything is grayish and the characters look like wooden puppets, the cinematic aspects of the game are bound to suffer. As for the sound, it is terrible. Sound effects are always more noticeable when they go badly than when they go well. In this game everything goes terribly. Footstep noises are not synced with footsteps, swimming sound effects last far longer than actual swimming, etc. The earthquake effects are decent, but nothing special. And there is almost no music. Maybe two songs over the course of the game, both of which jar the player out of whatever reverie he may have been in, since there had been no in game music for the previous several hours. Warning: This clothes hanger will not support over 500 lbs. There are gameplay concerns as well. For one thing the controls are poor. They feel sluggish and the character moves as though he is made of wood. Animations (e.g. climbing up a ledge) take too long, which is annoying when it must be done several times in a row. Often, when the earth starts shaking, the game slows down and sometimes it just slows down for no apparent reason. But the biggest complaint in this department is that gameplay feels too episodic. It seems as though the developers wanted a scene where you have to build a raft, a scene where you are hiding from attackers, etc. and then sewed these scenes together without adding any compelling flow to the gameplay. In essence it ends up feeling almost like a series of minigames with a plot. 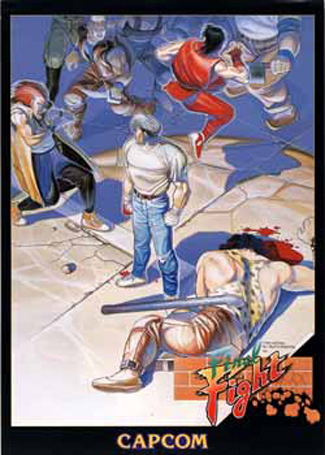 These minigames in large part overshadow the main game. This is partly a function of the lack of length to the game, but seems primarily due to poor general production. This claim is supported by my complaints about the graphics, music and sound. Without question, Disaster Report has some serious flaws. In my opinion it is still worth playing, however. It does not require a huge investment of time or money, and ends up being a fairly engrossing title. Basically it rates low on playability, but high on innovation, so jaded or adventurous gamers would most likely find it worthwhile. Pat, the innovative aspect of this game is indeed where the shizzle is at. I played about an hours worth back when i bought it 2 years ago and just have not had to motivation to go back to it. …and yet (perhaps oddly) i’d say that this is a good game. There is a strong desire on my part to support stuff like this. If they had acctually taken some of the elements you mentioned seriously this would have been one of my BGEs. As it is i appreciate that you included it in your top ten. Peoples of the world: learn from games like these and emulate them! i actually expected this game’s inclusion in my “top games” list to be a little controversial (to the extent anyone cares about what i have to say). it is more emblematic of the idea that i would rather play something new and flawed than polished and derivative than it is literally one of the greatest games ive ever played. I figured as much. I completely agree with your premise that “i would rather play something new and flawed than polished and derivative.” I think it’s a shame how rare innovation is in the filed, especially since unlike, oh lets say books, video games lend themselves to the possibility of innovation so well. I’m with you guys on giving innovation the nod over polish. I also have to admit that I really liked DR’s ten minute attention span take on gameplay design. Always having something new to do and never having any idea what was coming next made playing the game a treat for me. Have you tried the sequel to see if any of the other problems you encountered have been fixed, Pat? TT – i have not tried the sequel, but it is on my long and growing list of games to play. reviews seem to indicate that it was not a large step forward for the series. I’m looking to buy a crsiuer motorcycle for the first time but have no real clue what to look for when it comes to bikes.What would you recommend is a good starter motorcycle for someone with very little too no experience when it comes to motorcycles? I would like to keep it under $4,000 and I’d prefer a Honda or Yamaha crsiuer.